Some people think of fall as the long waiting period before ski and snowboard season starts. But those people are wrong. Dead wrong. Don’t waste these cool, crisp months longing for the slopes. Fall’s got plenty going on for itself and it deserves your full attention. So in between your foliage-peeping and cheering on your favorite team (Broncos, duh), take some time to get out and experience the jam-packed schedule of events happening this season. Hundreds of wines will be poured during the Grand Tasting. A totally immersive experience that’s part party, part performance, and totally one-of-a-kind. This fall beer fest also features fair foods, pumpkin cannons, go-carts, and much more. No sipping here! Tickets include a half-liter stein for all day beer-fueled fun. Get up close with Andrew W.K. He’ll be stopping by before his Summit Music Hall show for a free meet & greet -- and performance. This event packs so much fun, it spans two weekends. Don’t miss the stein-hoisting competitions and Long Dog Derby. This food & wine showcase highlights the best of the region and beyond. Show up to Blanc on Wednesday night with proof of student debt (email, bill, whatever) and be rewarded with beers, giveaways, and live music. All courtesy of a new finance company called SoFi. The free Autumn Gold Festival features live music, brats, brews, and more. This food truck rally will bring together dozens of the city’s tastiest mobile eateries. RSVP ahead of time for free entry. This event will feature local breweries, distilleries, and wineries pouring unlimited samples. 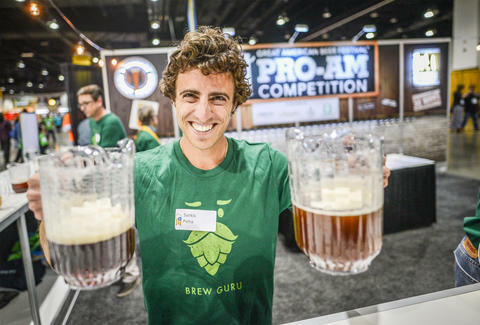 This is Great American Beer Fest weekend and even if you don’t have tickets to the main event, special tappings, release parties, tastings, pairing dinners, and more will be happening all over town. (Fake) blood and gore are required. Opt for a 5K or 10K and then enjoy brunch eats and drinks, live music, games, and more. The WhiskyX’s first Denver event will feature over 60 whiskeys, food samples, and music from Drive-By Truckers. This first-time event brings together artists, hobbyists, engineers, and more showing off their unique creations with hands-on activities and demonstrations. Harvest Week features nightly dinners highlighting fresh produce from local farms, prepared by some of Denver’s top chefs. Celebrate your favorite brunch cocktail at The Bloody Mary Festival. Chose from big name blockbusters, documentaries, short films, and more. Indulge in over 400 wines, beers, and spirits, and get some wine education at a variety of seminars and tour some local wineries. During Denver Arts Week you can enjoy free admission to many of the city’s museums as well as special events at dozens of art galleries in seven neighborhood art districts. Break out your favorite onesie and join a roving crowd for drinks and revelry. Boudler's restaurant week returns with $29 three-course prix-fixe dinner menus available at over 50 of the city's best spots. This holiday-themed 4-mile walk/run benefits the Mile High United Way. Molly Martin is a freelance writer in Denver, Colorado who loves fall but hates pumpkin spice lattes. Follow her Mile High adventures @mollydbu on Twitter and Instagram.